In Oded Hirsch’s video 50 Blue (2009), the artist’s brother struggles silently through muddied earth, over hills, and down rocky ravines to deliver his wheelchair-bound father to the shores of the Sea of Galilee. 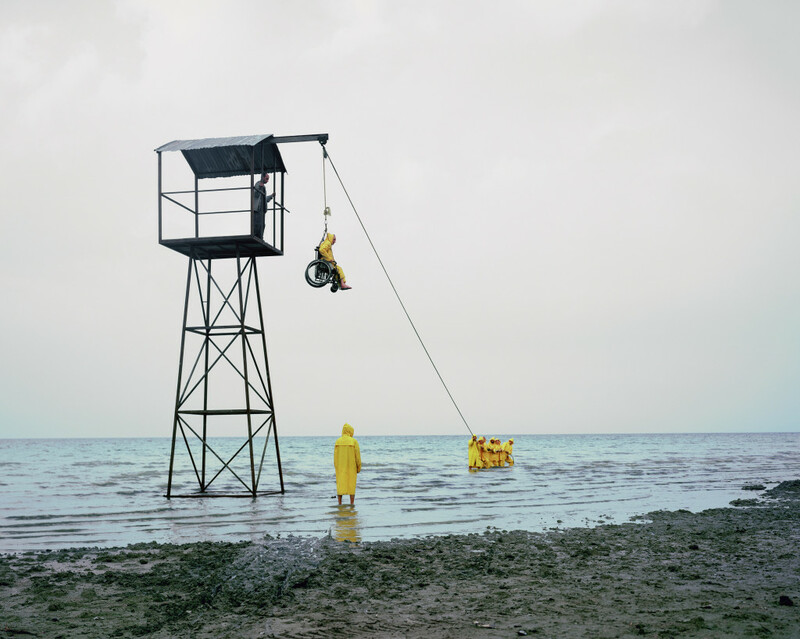 Yellow slicker-clad figures appear to hoist the father onto a rickety tower so that he may appreciate the view. It is this oddly pointless physical feat performed by a team of uniformed, anonymous beings, set in a spectacularly isolated landscape which emphasizes process as the priority. Hirsch questions the notion of purpose, togetherness and utopia, presenting work that is both political and parabolic, but still remains intimate and profound, inspiring a broad range of interpretation. Oded Hirsch was born in 1976 in Kibbutz Afikim, Israel. He holds an MFA in Visual Arts from Pratt Institute, Brooklyn, NY. His work has been exhibited at the Liverpool Biennial, UK; MASS MoCA, North Adams, MA; The Israel Museum, Jerusalem, Israel; The Neueberger Museum, SUNY Purchase, NY; The Contemporary Jewish Museum, San Francisco, CA; The Queens Museum of Art, NY; The Ramat-Gan Museum of Art, Israel; and The Jewish Museum, Munich, Germany. Hirsch is a recipient of the 2012 NYFA fellowship; the 2011 Jerome Foundation Film Grant; the 2011 Laurie Tisch Illumination Fund Production Grant; the 2010 Six Points Fellowship; the 2009 Artis Exhibition Grant; and the 2009 Foundation for Contemporary Arts’ Exhibition Grant. His work was featured and reviewed in The New York Times, ARTFORUM, New York Magazine, The Village Voice, ARTnews Magazine, and ArtCritical.